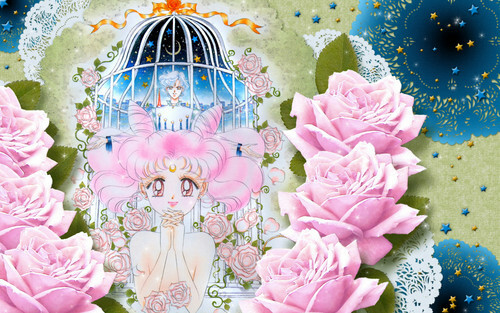 Helios & Chibiusa. . HD Wallpaper and background images in the Sailor Mini moon (Rini) club tagged: chibiusa sailor chibi moon rini sailor mini moon helios. This Sailor Mini moon (Rini) wallpaper contains ফুলের তোড়া, কাঁচুলি, পুষ্পগুচ্ছ, তোড়া, গোলাপ, রক্তিমা, গোলাপ, and rosebush. There might also be বুটি, গোলাপ গ্রীষ্ম বুটি, গোলাপ rosa damascena, আফিম, papaver somniferum, জাপানি খুবানি, মেই, and prunus mume.